OAK RIDGE, Tenn., Dec. 19, 2018—A team of scientists has for the first time measured the elusive weak interaction between protons and neutrons in the nucleus of an atom. They had chosen the simplest nucleus consisting of one neutron and one proton for the study. Through a unique neutron experiment at the Department of Energy’s Oak Ridge National Laboratory, experimental physicists resolved the weak force between the particles at the atom’s core, predicted in the Standard Model that describes the elementary particles and their interactions. Their result is sensitive to subtle aspects of the strong force between nuclear particles, which is still poorly understood. The team’s observation, described in Physical Review Letters, culminates decades of work performed with an apparatus known as NPDGamma. The first phase of the experiment took place at Los Alamos National Laboratory. Building on the knowledge gained at LANL, the team moved the project to ORNL to take advantage of the high neutron beam intensity produced at the lab’s Spallation Neutron Source. Protons and neutrons are made of smaller particles called quarks that are bound together by the strong interaction, which is one of the four known forces of nature: strong force, electromagnetism, weak force and gravity. The weak force exists in the tiny distance within and between protons and neutrons; the strong interaction confines quarks in neutrons and protons. 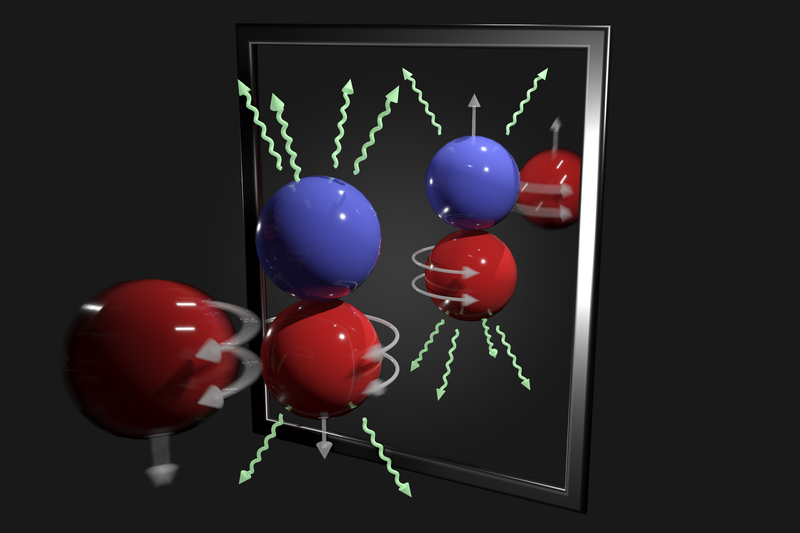 The weak force also connects the axial spin and direction of motion of the nuclear particles, revealing subtle aspects of how quarks move inside protons and neutrons. The NPDGamma Experiment, the first to be carried out at the Fundamental Neutron Physics Beamline at SNS, channeled cold neutrons toward a target of liquid hydrogen. The apparatus was designed to control the spin direction of the slow-moving neutrons, “flipping” them from spin-up to spin-down positions as desired. When the manipulated neutrons smashed into the target, they interacted with the protons within the liquid hydrogen’s atoms, sending out gamma rays that were measured by special sensors. After analyzing the gamma rays, the scientists found parity-violating asymmetry, which is a specific change in behavior in the force between a neutron and a proton. “If parity were conserved, a nucleus spinning in the righthanded way and one spinning in the lefthanded way—as if they were mirrored images—would result in an equal number of gammas emitting up as emitting down,” Bowman explained. The scientists ran the experiment numerous times for about two decades, counting and characterizing the gamma rays and collecting data from these events based on neutron spin direction and other factors. The high intensity of the SNS, along with other improvements, allowed a count rate that is nearly 100 times higher compared with previous operation at the Los Alamos Neutron Science Center. Results of the NPDGamma Experiment filled in a vital piece of information, yet there are still theories to be tested. “The weak interaction allows us to reveal some unique features of the dynamics of the quarks within the nucleus of an atom,” Snow added. Co-authors of the study titled, “First Observation of P-odd γ Asymmetry in Polarized Neutron Capture on Hydrogen,” included co-principal investigators James David Bowman of ORNL and William Michael Snow of Indiana University (IU). The lead co-authors were David Blyth of Arizona State University and Argonne National Laboratory; Jason Fry of the University of Virginia and IU; and Nadia Fomin of the University of Tennessee, Knoxville, and Los Alamos National Laboratory. In total, 64 individuals from 28 institutions worldwide contributed to this research, and it produced more than 15 Ph.D. theses. The research was supported by DOE’s Office of Science and used resources of the Spallation Neutron Source at ORNL, a DOE Office of Science User Facility. It was also supported by the U.S. National Science Foundation, the Natural Sciences and Engineering Research Council of Canada, the Canadian Foundation for Innovation, the PAPIIT-UNAM and CONACYT agencies in Mexico, the German Academic Exchange Service and the Indiana University Center for Spacetime Symmetries.